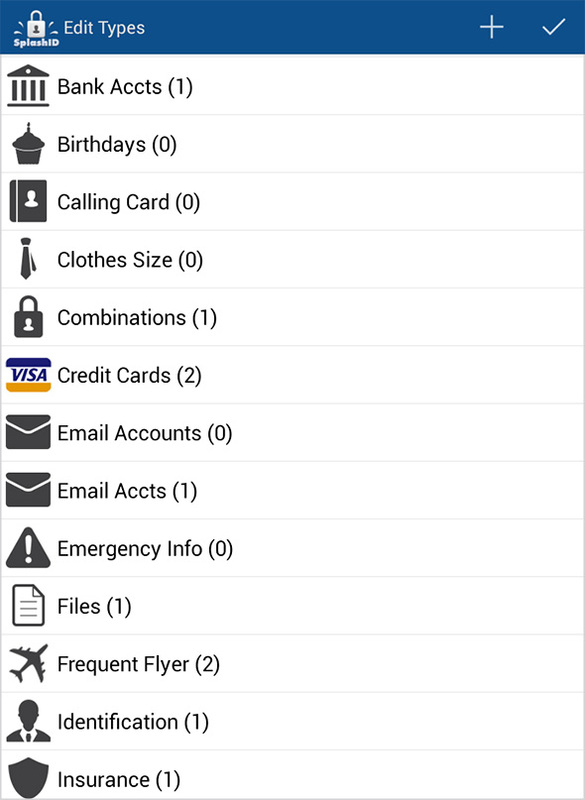 SplashID Safe provides quick and easy access to all of your personal identification information, including usernames, passwords, credit cards, PINs, calling card numbers, frequent flyer numbers, insurance info and more. 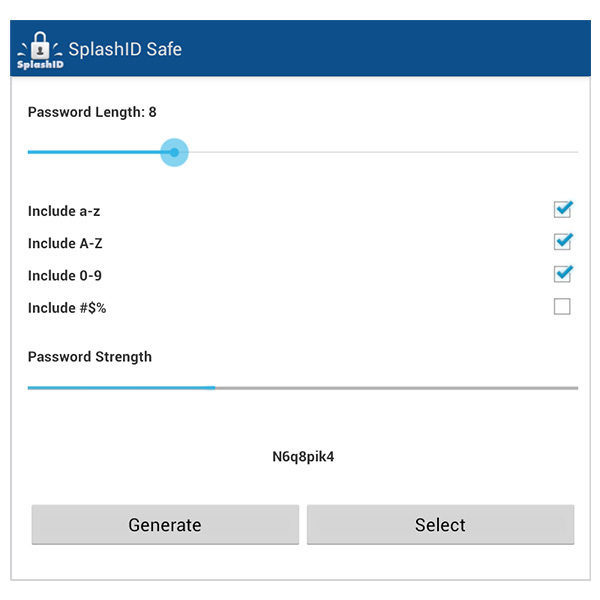 Data is stored in a secure, encrypted, password protected format and can be synchronized between SplashID Safe on your mobile device and SplashID Safe on the desktop (Windows, Mac OS, and web). You may prefer to do most of your data entry on the desktop, however, since it's faster and easier with a keyboard, and then synchronize the data with your mobile. The record list is your main view for SplashID Safe. From here you will browse, search, add, edit, and view records. When you tap on a record in the Record List, it opens the Record Details screen. From here you can copy by long-tapping a field, edit or delete the record, send the record, or open a web login in the built-in browser. While viewing a record, tap the Edit button to make changes. This is also what you see when you tap the New Record button from the Record List. 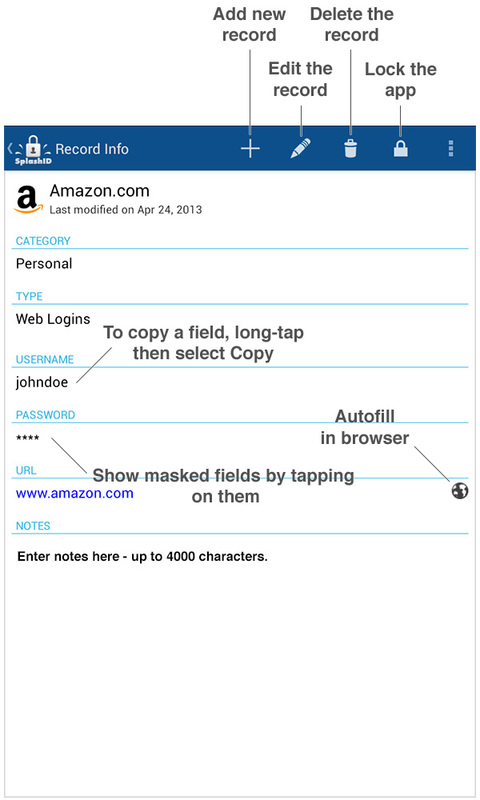 Customize Fields -- You may customize field labels or set the field masking. You may also edit field labels globally by going to Record List > Settings > Edit Types. Generate Password -- Opens our strong password generator tool. See below. Select the field in which you wish to generate a password. Press Menu > Generate Password. Choose from the "Include these Characters" table one or more options of letters, numbers, symbols, or a combination thereof. The Strength meter will show you how strong the password will be based on the selected attributes. Tap Generate. A password will be displayed for your review. Tap Generate again to generate a new one until you find one you like. Tap Select when you have decided. Categories act as filters for grouping related records. The two predefined Categories are Business and Personal, though you may add more by choosing Edit Categories from the Settings screen. Below is a brief description of what each of the settings do. Email -- This email address needs to be valid and the same on every version of SplashID Safe you use. Change Email -- Use this tool if you need to change your email for some reason. 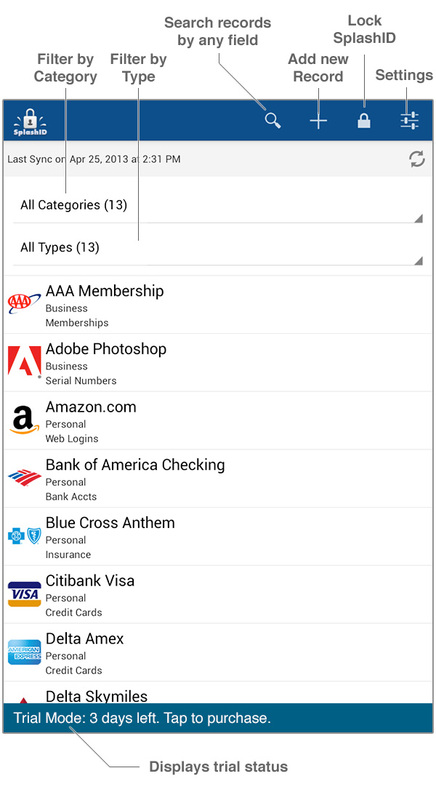 Account Summary & Sync -- View your account status and switch to a different sync solution. Account Password -- Select to edit the password protecting SplashID. See Security for more info. Clear Filters on Exit -- This preference, when enabled, will reset the Category and Type filter selections when you exit the application, so when you return all items will be displayed. Timeout Setting -- Change your auto-locking timeout period: Immediately up to 30 minutes. Edit Types -- Displays the Types which you may edit or delete. 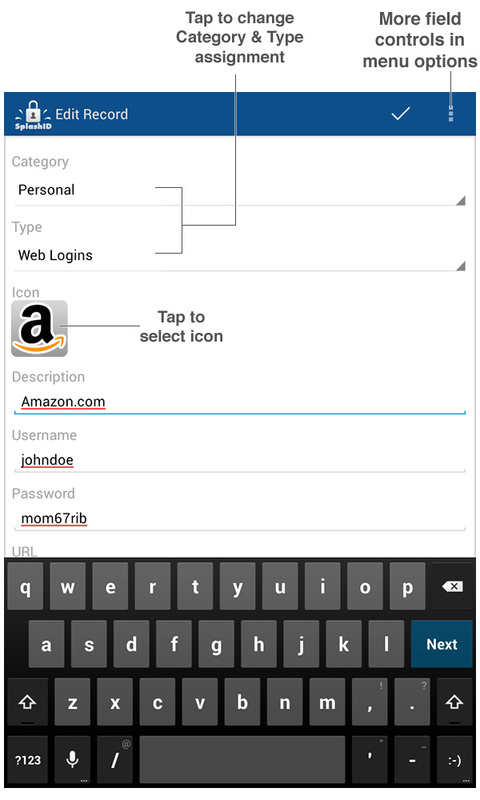 Select an existing type and tap edit, or tap New to create a new one. Edit Categories -- Displays the Categories which you may edit or delete. Select an existing type and tap edit, or tap New to create a new one. Delete All Records -- Deletes all records in the database, in case you wish to start fresh. Backup -- This will make a full backup of your encrypted SplashID database on your SD card. This way you can restore the database later if you delete and reinstall SplashID, have data loss, or if you change devices. Restore -- Restores a backup from your SD card. Please note that the password on your database will be replaced with the password you set at the time of the backup. Getting Started Guide -- This guide. Send Feedback -- This tool is intended to be used to make suggestions or feature requests. You will not get a reply to this email, so if you need technical support, please submit a ticket. About SplashID -- Displays the version info. Entering a Password -- You will be required to enter your password each time you launch SplashID, or when you turn on your handheld if SplashID was last running when it was turned off. Changing a Password -- To change a password, select Set Password from the Settings screen, enter your Old Password, then enter and confirm the New Password. When viewing the Record Info, tap the menu button, then select Email vID. Then you have the option to set a password, which will encrypt the file and is recommended. Then you will be taken to a screen where you enter the recipient address, subject, and any message you wish to add. A SplashID vID file will be attached to the email containing the record data. It can only be imported into the SplashID Safe desktop or web applications. From the Menu Options, select Backup SplashID. This will make a full backup of your encrypted SplashID database on your SD card. This way you can restore the database later if you delete and reinstall SplashID, have data loss, or if you change devices. From the Menu Options, select Backup SplashID. Please note that the password on your database will be replaced with the password you set at the time of the backup. The other better option to backup your SplashID data is to sync with the SplashID Safe desktop. You can download it from splashid.com.